Walked in today looking for a C7 Corvette Z06. Took 15 minutes before anyone even approached me. Asked what discounts they have and was told 12% off mrsp on 1lz and 10% off 2lz and 3lz, seems like a good deal except I am seeing other major dealers are offering 15% off or more. I asked if they priced matched since they are local and was told rudely no this is our price. Um okay... I said thank you and walked off. That was it. This reminded me at the end of the day I am still buying just another Chevy and why I have had 3 BMWs since then. So instead I had my buddy meet me there with his c7 Z06 so I could test drive it since the sales guy didn't even bother to ask me. Funny enough he told me when he tried to get them to match his deal in 2017 when he bought new they told him to go buy it at the dealer he found they deal at. So he did. Now it makes sense why they are sitting on over 155 new corvettes in stock and can't sell them. Little did they know I actually bought a new 2008 c6 from them (which I bought because they atleast tried to price match Boadwalk Chevy and got close enough) and a c5 before that. The day I bought my c6 I put my name down for a zr1 with the understanding I would get one at sticker. Got a call from them when they were starting to take orders but wanted a 20k market adjustment. They can go f themselves. I should have learned then. I will never will be back and will never go there for service when I get the C7. And in a few years when I am ready to buy a C8 comes out I won't even think about going there. They lost a life long customer. Last edited by LS3Kid; 03-17-2019 at 01:22 AM. I live in Kerbeck country and am a loyal Kerbeck customer but since you are from Criswell's area, Mike Furman of Criswell has a great reputation and you would most likely have a better experience dealing with him directly. Did you try getting in touch with him rather than just a random salesperson at Criswell? 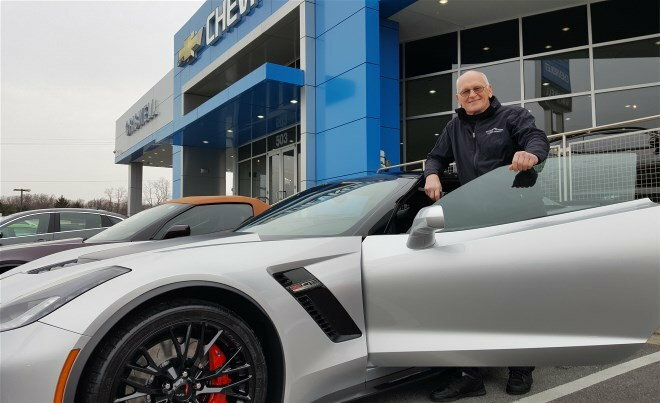 He is Criswell's top Corvette salesman. On any specific set of expectations, any dealer won't always meet them. I bought my new C7 in-State and in-stock because it was almost exactly what I would have ordered, AND, I got nearly -20% discount off MSRP. I have no dealer loyalty when they're not able to at least match the best price I can find in the Country on the purchase of a new Corvette. Plenty of Chev. dealers within 500 miles of my home have turned down my new Corvette purchasing criteria. That's always going to happen. I just find one to work with. Choose another dealer. No but I know of him just never worked with him directly. I just walked in on a whim since I was close by running errands. I still think there should besome consistency across salesmen. I have no interest in reaching out to them anymore. Check the dealer section. I am seeing up to 17-18% off on some 19 Z's. Also have seen 20-25% off leftover 17 and 18s just can't find any with the right spec. A friend of mine here in Western Nebraska bought a new GS from Criswell. Said it was his best car buying experiece ever and it was not from Mike. Buying one Corvette from them in 2008 does not make you a life long customer. You needed to talk to Mike Furman do yourself a favor and give him a call. I live 45 minutes from Kerbeck and 2.5 hours from Criswell and found that the deal I got from Mike Furman at Criswell on the 2019 3lt Grand Sport I purchased from him in October to be the same I could get from Kerbeck. Mike stood out from Kerbeck in that Criswell was willing to give a more than fair price on my 2o15 Stingray I was trading in, where Kerbeck low ***** all trades because they don't keep used Corvettes on their lot. I did purchase my 2012 Grand Sport from Kerbeck and the buying experience was great. When I started looking for the 2019, I contacted Mike Furman and he provided a sight unseen trade offer on the 2015 and provided a full disclosure price on the new car. Mike sells a lot of cars, so once a deal is made, an appointment is made for delivery. I arrived at Criswell at 9am on a Saturday morning for my appointment and was out the door by 10am. The easiest and most upfront car purchase I have ever had. Mike was responsive to all my questions and calls. Give Mike a call and tell him what you are looking for. There is a reason why he personally has sold over 4000 Corvettes to buyers all around the country. Last edited by cds62; 03-17-2019 at 07:51 AM. ol’ boy. If I was in his area that’s who I’d buy from. He even gave me a good price on my caddy sight unseen. You won’t regret talking to him. Wow, This is the 1st negative post that I have read about Criswell, look out Mike! I am going to give you the same advice as the previous respondents. Call Mike Furman. I would bet you a cold six-pack that he can get you a better price on the car you want then any other salesmen at that dealership. It is worth a try. Last edited by mdolandese; 03-17-2019 at 08:14 AM. Did you get 15% off your BMWs? Criswell?....one of the best experiences of my life !!! Call mike furman and explain what happened and what you want to pay. You will not be disappointed and you can take that to the bank. Mike is the gold standard of corvette sales. It’s 2019. Who walks into a dealer to buy? Use the phone. Work a deal. Make better use of your time. When I arrive at a dealer, it’s to exchange funds and confirm the condition of what I am buying. I have no desire to work with some nitwit who runs back and forth working with their manager for me. That crap may have worked in the 1960s, 1970s and even 1980s ... if you let it work today, you are the nitwit. OP, chill. Use the internet and your phone. Obviously time to move on and find a dealer that meets your standards. Most people purchase a car on emotion, I remind you make sure your purchasing as a business transaction , they made and offer ,you made a counter offer? they did not take it Move on ,there should be nothing more than that . Last edited by Ih2lose; 03-17-2019 at 09:28 AM. Quick Reply: Criswell Chevrolet - Avoid!! !